Regional law enforcement and coroners from around the state participated in a one-day training on death scene investigations on Tuesday, Nov. 27. 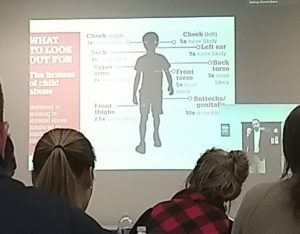 The training, facilitated by Susquehanna County Coroner Anthony Conarton, was conducted via an internet livestream by Darren Dake, a Missouri-based, ABMDI accredited death investigator and ACFEI certified criminal investigator. Dake is the Director of Operation and instructor for Death Investigation Training Academy. Two types of death investigations were covered in the training: suicide and child deaths. In the session on suicide deaths, Dake demonstrated how investigators could tell the difference between homicides staged to look like suicides, as well as accidental deaths that appear to be a suicide. Conarton said an investigation would attempt to answer whether the person intended and were able to perform the act that ended their life. “There are so many factors we look at,” he said. In the afternoon session, Dake’s training focused on child death investigations, including Shaken Baby Syndrome -the leading cause of infant trauma death. “Normal interactions do not cause Shaken Baby Syndrome,” Dake said. He noted that the death could come hours or even days after the trauma. Dake stressed investigators gather a 72-hour timeline, including all caretakers, preceding the child’s death. He also said investigators should be familiar with typical child development milestones. Dake advised investigators to note the size, shape and location of any bruising. “A non-mobile infant should never have bruises a caregiver can not explain,” he said. Dake also provided tips on interview and evidence collection techniques that investigators should utilize. Class participants included investigators from Pennsylvania State Police, the Forest City Police Dept., and Luzerne, Lackawanna, Lycoming, York, Mifflin, Wayne, Washington, Sullivan and Union counties. The class enabled participants to earn six-hours of continuing education credits. Be the first to comment on "Investigators receive death scene training"